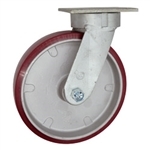 4" Kingpinless Swivel Caster - Poly Tread on Aluminum Core Wheel - 700 Lbs Cap. 4" Kingpinless Swivel Caster - Poly Tread on Aluminum Wheel with Ball Bearings - 700 Lbs Cap. 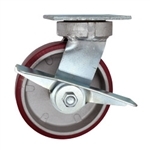 4" Kingpinless Swivel Caster with Brake- Poly Tread on Aluminum Core Wheel - 700 Lbs Cap. 4" Kingpinless Swivel Caster with Brake- Poly Tread on Aluminum Wheel with Ball Bearings - 700 Lbs Cap. 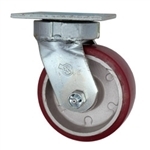 5" Kingpinless Swivel Caster - Poly Tread on Aluminum Wheel - 900 Lbs Cap. 5" Kingpinless Swivel Caster - Poly Tread on Aluminum Wheel with Ball Bearings - 900 Lbs Cap. 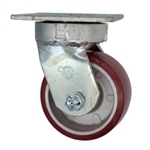 5" Kingpinless Swivel Caster with Brake- Poly Tread on Aluminum Wheel - 900 Lbs Cap. 5" Kingpinless Swivel Caster with Brake- Poly Tread on Aluminum Wheel with Ball Bearings - 900 Lbs Cap. 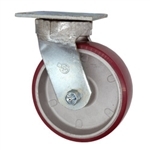 6" Kingpinless Swivel Caster - Poly Tread on Aluminum Wheel - 1,200 Lbs Cap. 6" Kingpinless Swivel Caster - Poly Tread on Aluminum Wheel with Ball Bearings - 1,200 Lbs Cap. 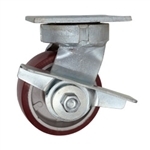 6" Kingpinless Swivel Caster with Brake - Poly Tread on Aluminum Wheel - 1,200 Lbs Cap. 6" Kingpinless Swivel Caster with Brake - Poly Tread on Aluminum Wheel with Ball Bearings - 1,200 Lbs Cap. 8" Kingpinless Swivel Caster - Poly Tread on Aluminum Wheel - 1,250 Lbs Cap. 8" Kingpinless Swivel Caster - Poly Tread on Aluminum Wheel with Ball Bearings - 1,250 Lbs Cap. 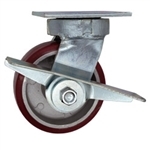 8" Kingpinless Swivel Caster with Brake - Poly Tread on Aluminum Wheel - 1,250 Lbs Cap. 8" Kingpinless Swivel Caster with Brake - Poly Tread on Aluminum Wheel with Ball Bearings - 1,250 Lbs Cap.